Board indexOff RoadTrail Rides / TripsPacific U.S.
JamesDowning wrote: Bill, I don't think there's any way that all 5 bolts could have worked loose. Even if some did, there would be a couple that would have snapped before rattling out all the way. Nothing else missing? No bolt studs left in the axle housing? Oh yeah... good looking trip. You guys meet up with a group? The 8.6" in the EXT/V8 isn't the same pattern as all the other 8.6" diffs, is it? I thought the issue with getting one special made from PC was that while our ring is the same, the bolt spacing is a little different, or something? Great looking trip. Wish we had country like that here. Be a nice trip to go on for sure. Im willing to bet about anything someone say you driving with it and followed you home to steal it later. Or snagged it from somewhere you were at for a period of time. Ive seen weirder things stolen off cars and trucks. If they are different, they are close enough to the other 8.6's (and 8.5's) that visually it'd be hard to tell without another to compare it to. Cool pics, I need more areas like this to wheel. Well, I just swapped out the driver side CV shaft. Fixed THAT grinding noise. And it allowed me to clearly hear the passenger CV joint grinding now... Sweeeeeeet. Now that i've done one, i'm feeling pretty fluent and confident in the job. Perhaps i can do this one in half the time. Gotta love a good challenge. You'll find the second one goes twice as fast. It's all about experience. Now get it fixed and lets meet up and get out there before I figure out what I am doing with mine! 04 T.B. 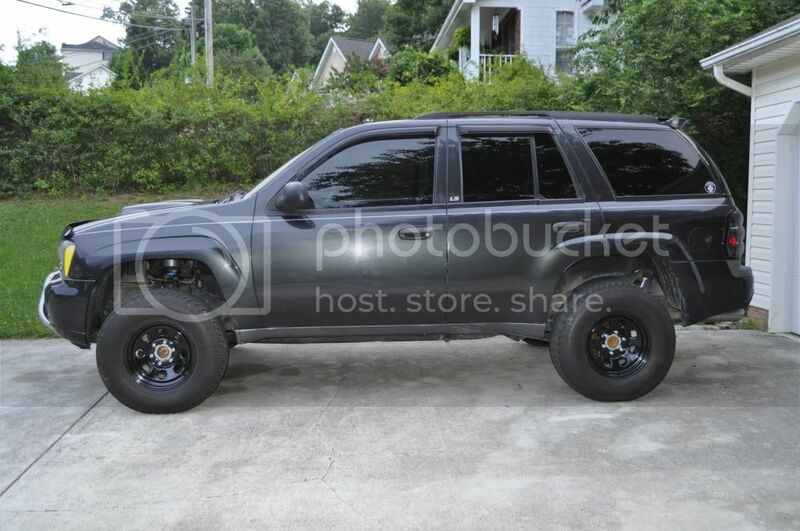 with McMeister lift, airraid CAI, flowmaster 40 series, Bridgestone Dueler apt 4's, and a G-80! I'll probably do the other one today after work. Then we'll get out there! If you go out with Nick, make him promise to not tailgate. A 4WD without G80 and a 2WD with G80 put together make one vehicle that can get out of trouble on its own. Dont think your getting out of going with us, roadie. Ill send K to the spa for the weekend, if I have to. Clean it out, repack it and keep it as a trail spare. The round ball thing ( 3 of them in the pic ) just pulls off, there are needle bearings inside. Just clean and repack it all with grease. DirtyBacon04 wrote: I'll probably do the other one today after work. Then we'll get out there! Let me know, im available Tuesdays but have work at 11pm, Wednesdays, Saturdays, but have work at 11pm, and the next two Sundays. The Roadie wrote: If you go out with Nick, make him promise to not tailgate. Not that I think Bill forgot about the video... Just wanted to show how anxiously I await it's presentation!